Selling t-shirts online is a great way to generate a passive income, especially because it’s something everyone can do, you definitely don’t need to be a designer to run a successful t-shirt business. If you haven’t decided on a specific print on demand site to sell your designs on, I suggest you read this post that tells you where to sell t-shirts online, it comes with a Directory of Print on Demand Sites that will come in real handy when choosing other marketplaces to sell your designs besides Merch by Amazon. For those of you that prefer to screen print your t-shirts at home, you might want to know which is the best t-shirt screen printing equipment. Coming up with great t-shirt designs that sell can be quite hard if you don’t have the right tools to help you out, to save you from all the hassle, we went ahead and compiled the best resources from the industry so you can find the perfect t-shirt template for your t-shirt business or charity run t-shirts, all in one place! I’ve divided these t-shirt templates into three categories: tools, freelancers and downloadable resources for you to edit on your own. Ready? Let’s dive in! This is an app that aims towards mobile and creativity. It allows you to make beautiful visuals from scratch using your own photos or their assets and presets. 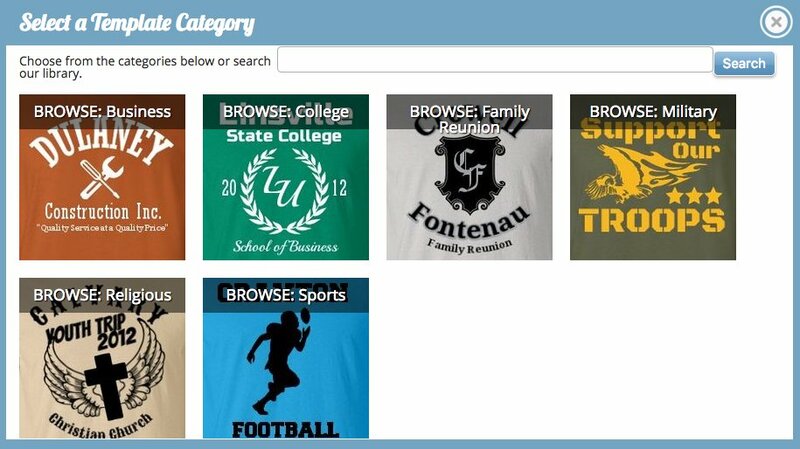 Over has gained popularity between t-shirt sellers due to its easy-to-use interface and a huge variety of icons, patterns, and fonts that make great t-shirt templates for Merch by Amazon, Teespring and other POD shops. Key features: the app comes with presets for different social outlets and formats. They teamed up with Unsplash to provide beautiful photographs for you to use for your designs. Pricing: Free with paid options and add-ons. The downside: the vast majority of their most eye-catching resources fall under the “PRO” label. Not available on desktop or Android. This is not meant to be used for t-shirt templates specifically, so there is no Merch by Amazon or POD presets. 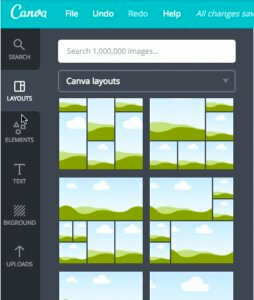 Bonus: Overcomes with in-app tutorials for making the most of your designs, great for beginners! Make-Merch is one of the most popular t-shirt design makers among Merch by Amazon sellers, it uses the patented Doogma Designer™ for an easy-to-use product design experience and allows the user to create tons of t-shirt designs to upload to their online stores. 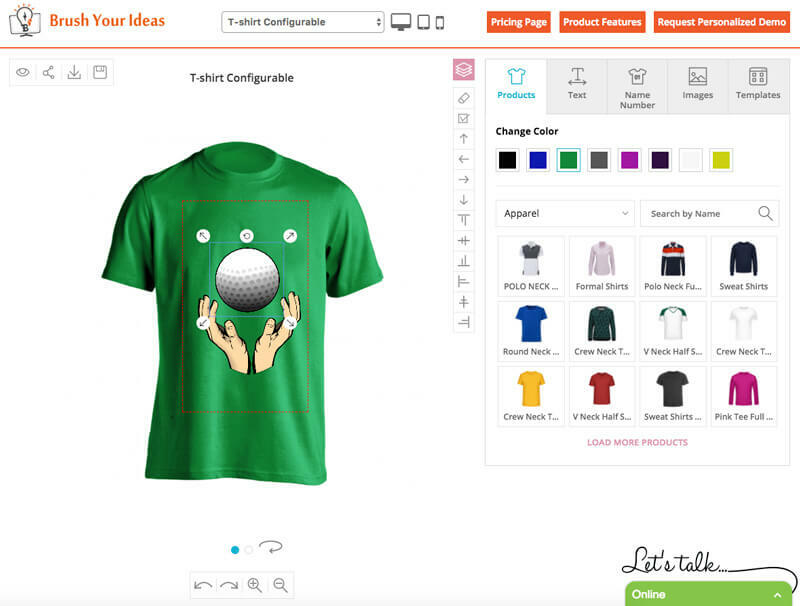 Though still in Beta, Make-Merch has established itself as one of the go-to tools to make a t-shirt design. Key features: download sizes are Merch by Amazon ready, no need to edit the files afterward. Ability to nudge the text lines up and down. They have a couple of t-shirt templates for inspiration, these have different text alignments. Extensive library of merch ready graphics, regularly updated including seasonal images. Unique filters can be applied to all graphics. The downside: Mobile restrictions. If you have an iPhone and are nowhere near a computer you might want to wait to get to one. This service is not fully functional on iPhone at the time. Bonus: You can use the service in full without a subscription, you won’t need to pay until wanting to download your t-shirt design. 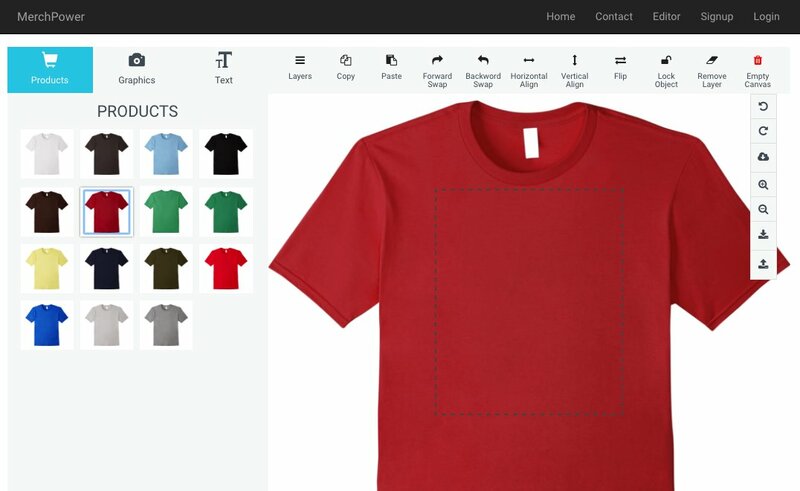 They are constantly adding new graphics, fonts, and features to improve this t-shirt template tool. 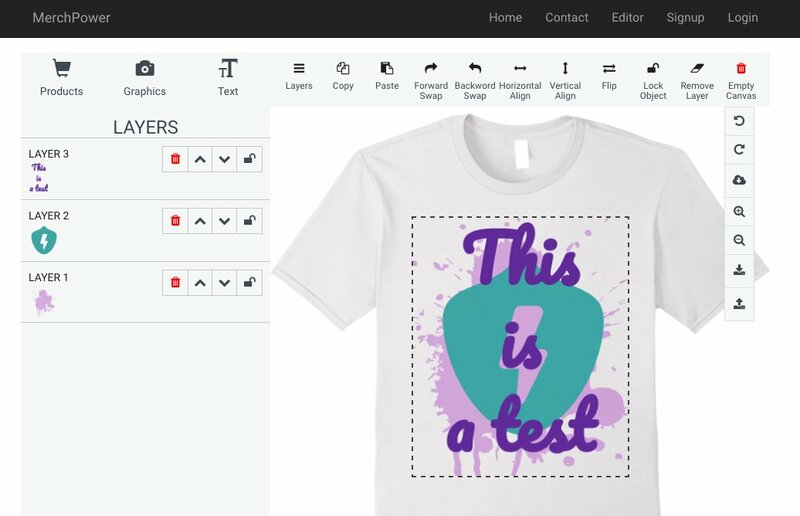 Design templates is Placeit’s new tool for t-shirt sellers, it lets the user choose t-shirt template and create a design to print on a tee. Packed with tons of assets and graphics and with Placeit’s intuitive sense of usability, non-designers are given the possibility to make a beautiful t-shirt design without any design knowledge whatsoever. Key features: tons of t-shirt templates with different layouts and arrangements. Files are 300 dpi PNG (transparency is supported) and there are several size dimensions available, according to different social media and POD requirements. Pricing: 100% free with any Placeit subscription. The downside: the system automatically arranges text and objects for you in a way that makes sense, so you are not allowed to manually reposition any of the elements in the design. Bonus: Can also be used for social media imagery creation as there are presets for different outputs. New templates are being added every day. 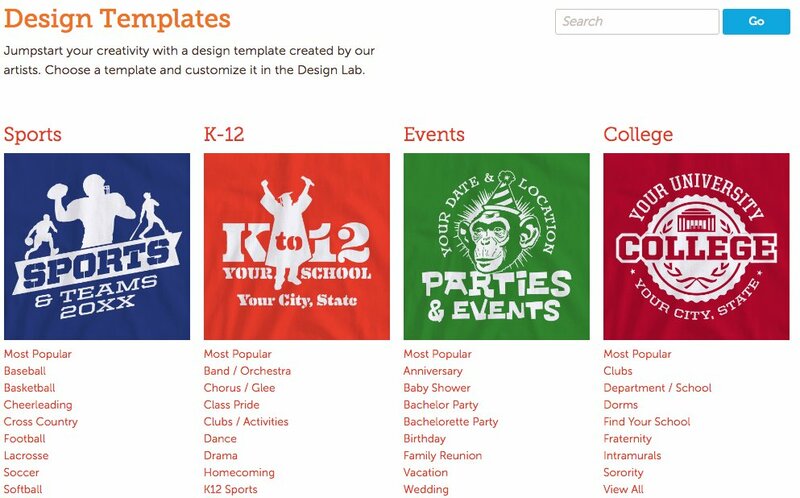 Design a Shirt was one of the first design makers for t-shirt templates. 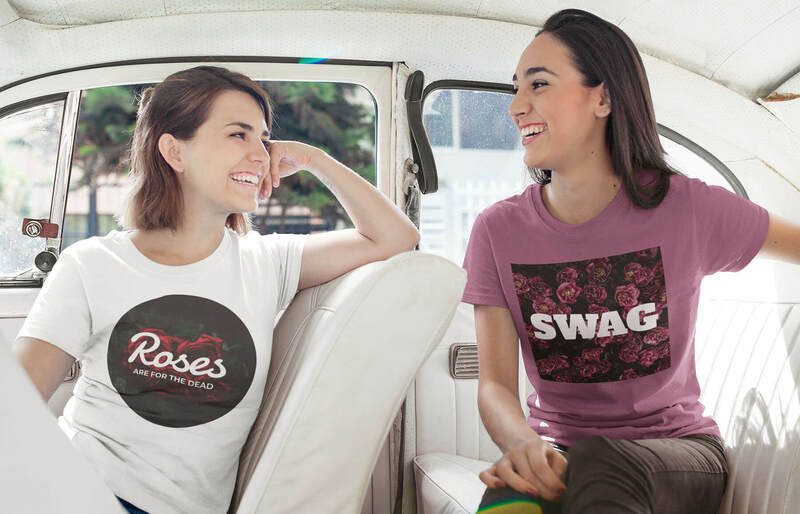 Besides allowing users to create tshirt designs to sell to the masses, this tshirt generator is mostly used among people looking to design and print single tshirts or sports teams uniforms, it has also gained popularity due to the rising trend of bachelorette tshirt designs. Key features: you can upload your own art file, or visit the idea gallery for more design inspiration. You can personalize your order with the Names & Numbers tool, which is great if you are making tees for sports teams. Pricing: tool and assets are free. The downside: If you plan on selling your t-shirt designs outside of this platform, these won’t be of use as you don’t get an option to download them, even on a paid option. Bonus: this design studio has the option to save your design or send it to a friend for more feedback before publishing it. Though this is mostly a graphic design tool and not specifically meant for t-shirt templates, lots of t-shirt designers and sellers find it useful for making quick graphic tees on the go as it offers tons of different presets and layouts with a variety of fonts and graphics. Key features: you are able to choose from a wide set of layouts or use custom dimensions. Pricing: this site is free to use, but most elements will have a watermark, to remove it you will have to purchase the premium elements (most are $1 each). 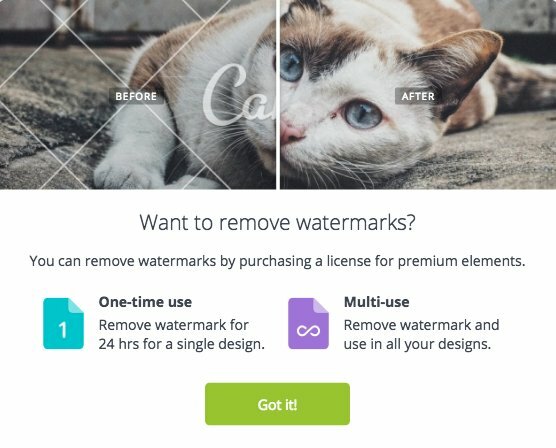 Purchase premium elements one-by-one $1 each or $10 Multi-Use (you can use the same asset without watermark forever). You can also credit your account in advance. The downside: you are not allowed to make a Merch by Amazon ready file, their max height is 5000 px. Read more on Canva’s license agreements here. Another great t-shirt designer that delivers merch ready designs is MerchPower. This is a simple looking, yet powerful tool that has tons of tiny little features you didn’t think would come in so handy. This t-shirt template tool delivers a 4500×5400 px transparent background PNG file you can upload straight to MBA. Key features: you can easily center, flip and adjust the transparency of text and graphics. Besides from preset clip art graphics, you can also use the hand draw tool or add a QR code. A great feature from Merch Power is the fact that the elements in your design are divided into layers, making easy for you to toggle between them. The downside: there aren’t that many available icons or graphics at the time. Hopefully more options will be added in the future! Bonus: if you are into the graphic tee business, this is for you. The text editor offers many options such as curved text, line height, alignment, font size, font style, etc. It hasn’t launched yet, you can join their Pre-Launch List to get more news on when the Beta version gets released and catch some discounts! 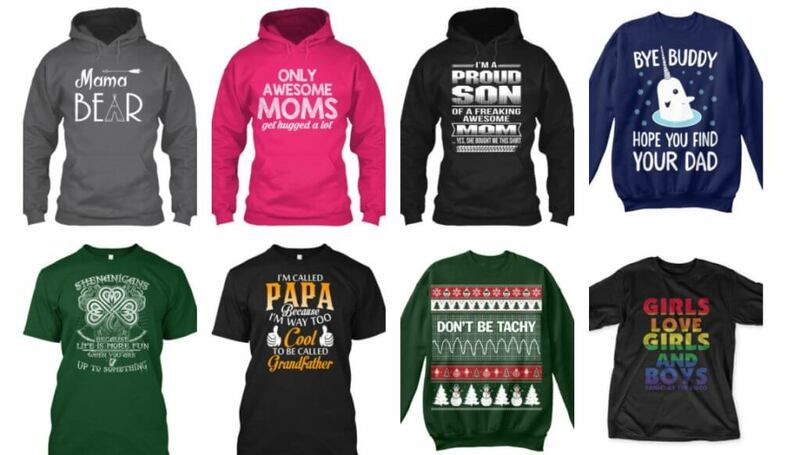 Teespring is one of the major Print-on-Demand shops out there, they have years of a trajectory to hold their backs, but we’re not here to talk about their business but about their t-shirt designer instead. T-Shirt offers a built-in design maker that allows their users to make instant graphic tees on the go. 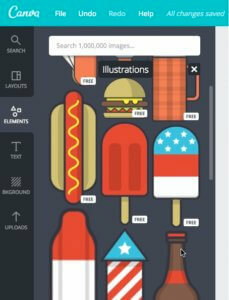 Key features: you are allowed to use the type tool, browse artwork or upload your own. Or all three! Pricing: 100% free to use. The downside: there’s no way to actually download the file for the t-shirt design you created, so your only option is to sell it on Teespring. Bonus: by selecting the style and design of the garment you can actually see how the design will fit the actual product. 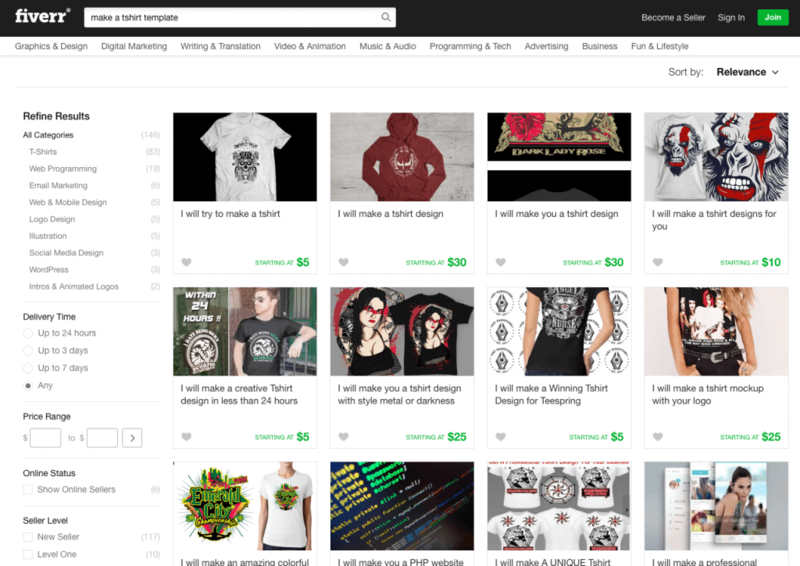 If you are into the online t-shirt business, you’ve probably heard of Spreadshirt, another one of the big names in the industry that decided to take matters to their own hands and create their own t-shirt design tool for both beginners and the more experienced sellers. Key features: they have t-shirt templates that allow you to simply replace some text fields and use the preset elements to make a t-shirt design that can go straight to your shop or the marketplace. 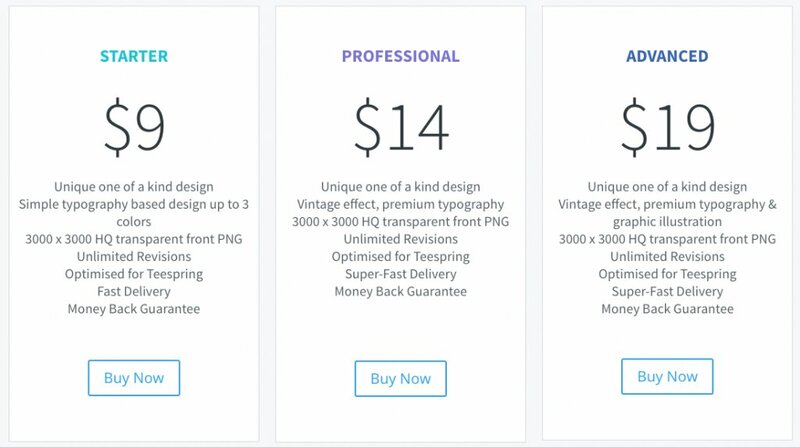 Pricing: the design tool is 100% free. The downside: just like Teespring, Spreadshirt encourages its users to sell their designs on their site so they don’t have an option to download the design file. Bonus: not only tees, but you can also use Spreadshirt’s designer for baby apparel and merchandising such as mugs, backpacks, phone cases, etc. They call themselves print geeks for a reason, and that’s because they really mind the details, this is a family-owned company that its fully designed to take care of you, from the designing to the printing process, which is a refreshing feel, to be honest. 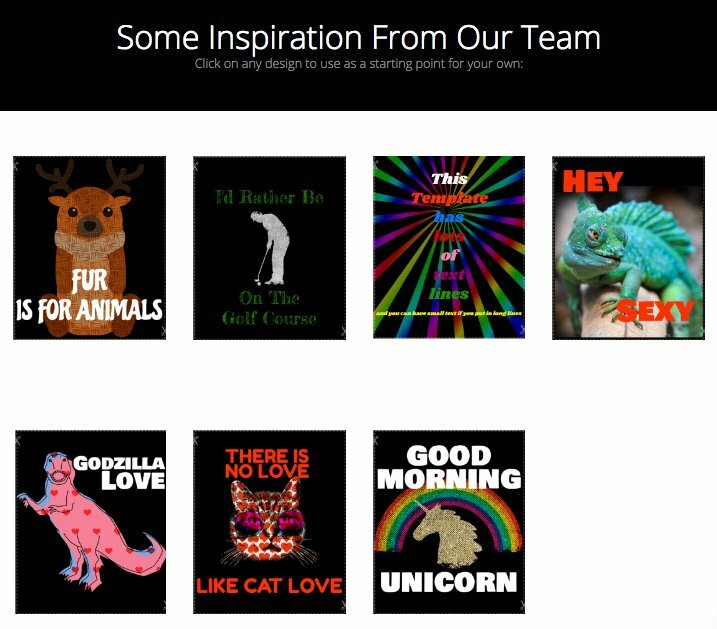 Their design tool is very much like all the others with some cool features and additions that stand out, besides, they have one of the largest clipart libraries among these t-shirt template makers. 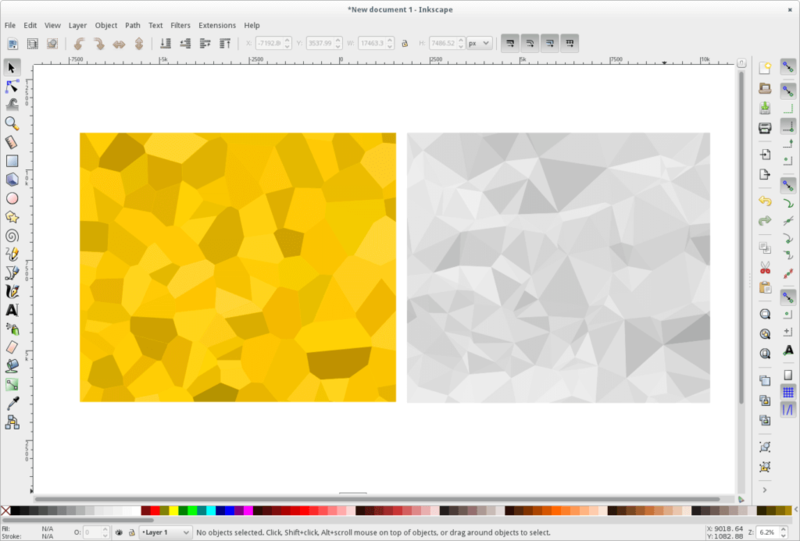 This tool has a couple of design features that may be of help when creating t-shirt designs, like Distress, which adds an effect to the clipart, text or image or Mask, which puts your design inside a shape. Like other tools, Rush Order Tees also allows you to personalize t-shirts for teams or groups with names and numbers. The downside: no option to download your design or to showcase on mockups with people in context. Bonus: if you decide to create and print your t-shirt designs with them they offer great assistance for design review and repair, which is great for beginners! When it comes to creating and selling t-shirts online, CustomInk is definitely one of the big guys. 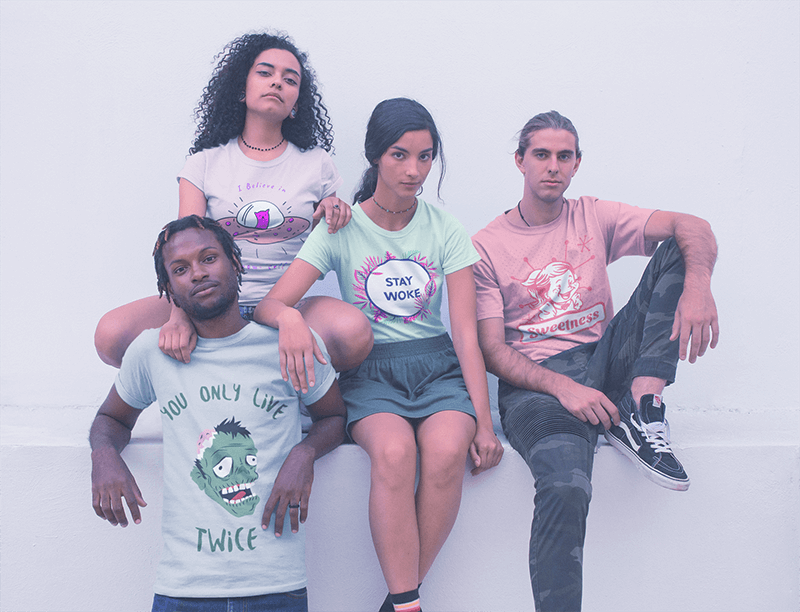 They offer tons of products with a great variety of styles, besides, their Design Lab is very user-friendly, which makes it easy for people who are not into the t-shirt business to go ahead and create an account and start selling tees. Key features: great looking graphics that go along with the latest t-shirt template trends, their assets don’t seem outdated. Besides being able to add text, clipart, and numbers you can also add your own artwork and mix it up with their assets. They allow you to print on the sleeves, hood or side leg (depending on the garment). Bonus: they have preset design templates that are divided into niche specific interests, which is great when creating tees for a narrowed audience, besides, these are super easy to edit. Great customer support! 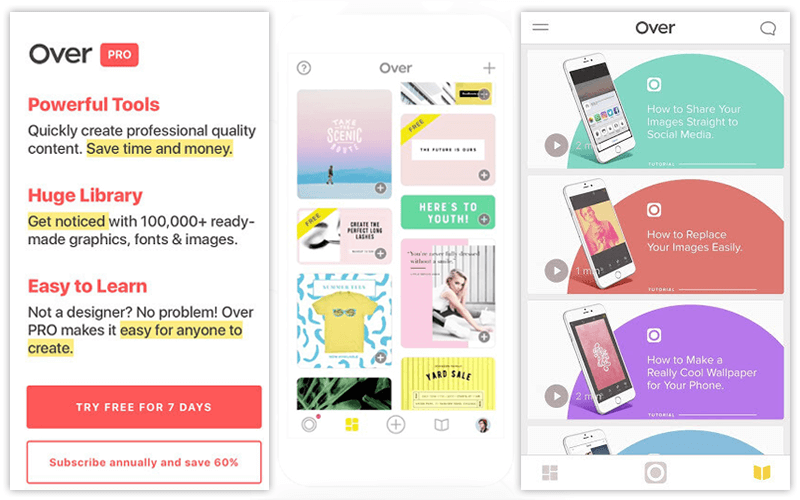 Wooptee allows you to sell not only t-shirts but all sorts of merchandising goods and they also feature a design maker that lets you create the designs straight from your browser, no Photoshop, or anything. Just add text, art, your image and arrange the elements to create a t-shirt template that works for your t-shirt business and your audience. Key features: you can add clip art or Whoptee has the option to add Names & Numbers to your tees, great for teams or group t-shirts. The different elements in your design as considered as layers and you can move them to the top or bottom. The downside: again, you are not allowed to download the final design file by itself to upload to other platforms. Graphics and fonts seem to be a bit outdated compared to other design makers. Bonus: aside from using clipart or your own artwork, you can also load a template, these come in different categories, which range from sports, College, Military, Family to even Religious and Business. Key features: TeeCampaign 2.0 is packed With over 700 premium t-shirt designs for 9 of Teespring’s best selling niche groups and available for immediate download. They throw in Niche Spy Pro, a tool to spy on your competition’s social media promotion efforts. The downside: since these are preset t-shirt templates, there is a chance that other t-shirt sellers will have the exact same t-shirt design offered at their shops. I suggest making some edits to the files before uploading to your site to avoid this. Bonus: they have a 60-day money back guarantee if you don’t make any sales on Teespring, Teechip, Teezily or Gearbubble. Fiverr is a platform for hiring freelancers from all around the world. You can find some hidden gems in here as some of these guys are design students looking to make some money on the side. Be careful when hiring people on Fiverr, keep in mind the Internet is a huge place that holds all sorts of people with all sorts of intentions, there have been cases of people purchasing t-shirt designs from freelancers on Fiverr only to later find out that these designs belong to someone else and are even already listed under some other brand’s profiles or shops. I suggest you read the reviews of each designer before hiring them or using the designs they deliver for your own shop. Looking to delegate the t-shirt designing task to someone else and focus on other matters in regards to your t-shirt business? Hey, that’s also an option and Raft-shirt is a design agency that’s meant to help you out if this is the case. No need to break the bank or your brains while attempting to come up with successful t-shirt designs, let someone else do it for you! Key features: you give them an idea, they make a t-shirt design around it for you to sell it online, easy as that. They deliver a first draft of the t-shirt design in just 24 hrs. Pricing: these guys will do as many t-shirt designs as you want for the following amounts. The price variations basically depend on the complexity of the design, the elements used on it and the delivery time frames. The downside: since they do the design for you, you have to rely on their taste and capabilities, but with unlimited revisions, that doesn’t sound so bad. Bonus: they advertise their services as “Optimised for Teespring” but we asked if they’d deliver a t-shirt template in different dimensions, for example in Merch by Amazon size (4500 x 5400) and they said definitely yes, so kudos on that! CorelDRAW is a vector drawing program that wasn’t specifically made for t-shirt designers, but it can be used for the job. There are different versions of the program available, some more complete than others. Although it can be a bit more tricky to use for those with minimal graphic design skills, the freedom it provides and the endless amount of finishes, styles, and designs you can come up with make it worth taking the time to learn it all. Key features: make your designs more dynamic with features that allow you to fit objects to a path or impact effects that are perfect for comic or graphic type designs. Pricing: investing in CorelDRAW may be scary for someone who’s never used it. Luckily, you can get a 15-day free trial to try it out. 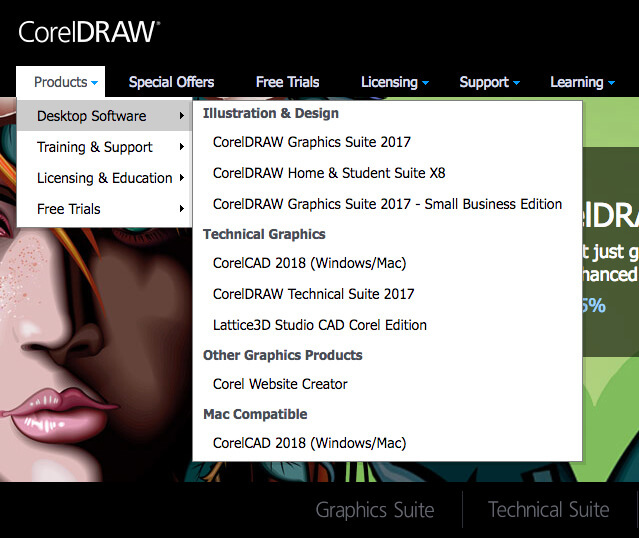 After that, the CorelDRAW Graphics Suite 2017 will set you back $469, while the CorelDRAW Home & Student Suite X8 will cost you $109.99. The downside: the program can get a bit pricey and isn’t the easiest to use. It’s also worth mentioning that since it isn’t made solely for t-shirt designing, there are no preset dimensions for you to rely on. Bonus: they have tons of free tutorials in their Corel Discovery Center and they use Facebook to share loads of download links to resources like free fonts, design tips, and trends. There’s a reason why Inkscape’s tagline is Draw freely. This open source graphic design program gives you the freedom to do just about anything you please. From drawing freehand to importing images to manipulate, you have all of the control over your designs. Key features: like other graphic design programs, Inkscape allows you to draw, use text, insert shapes, manipulate objects, work in layers, and incorporate all types of file formats, all with professional results. Pricing: although this program is free, they do have an Inkscape Fund where users can donate money as an appreciation to the developers. The downside: this program is similar to CorelDRAW and Adobe Illustrator, meaning that it can take some time and practice to get used to, especially if you don’t have any graphic design experience. Bonus: the Inkscape community is huge, so there are plenty of resources available. From tutorials to live chats, there is always something to explore in the Inkscape community. DesignDonkey is the #1 t-shirt and hoodie maker for Merch by Amazon, and it’s not hard to see why. This t-shirt design software was created to help Merch by Amazon designers generate t-shirt designs that combine text and graphics. The program is incredibly easy to use and creates images that are ready to upload on Merch by Amazon. It’s an easy to use program that also gives you the freedom to play around with fonts, images, layers, and graphics. Key features: the program is very easy to use and all of the designs you create are ready to submit to Merch by Amazon. They offer a long list of fonts to choose from as well as a graphics search bar that pulls images from Pixabay. 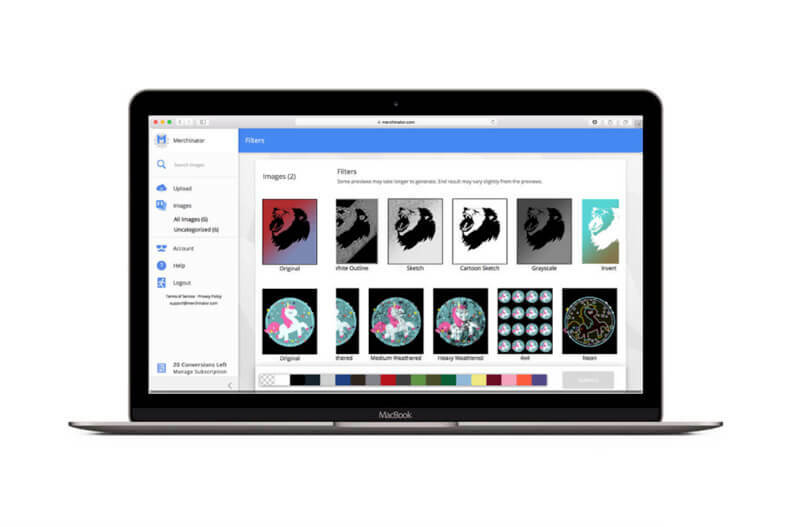 You can also import your own images and fonts. Pricing: the program works as a monthly membership service. You start off with a free 3-day trial, but after that, you will be billed $24.99 a month for an unlimited number of designs. The downside: the program isn’t available for mobile, but it does have a mobile counterpart which you have to pay for as well. Bonus: although the program was designed with Merch by Amazon in mind, your designs can also be used on other POD sites. Although DesignDonkey isn’t available for mobile, it does have a mobile counterpart called WordRabbit. Like DesignDonkey, WordRabbit is easy to use and has preset dimensions for Merch by Amazon sellers. The program basically works in the same way as DesignDonkey, allowing you the freedom to play around with text and graphic elements as you please. 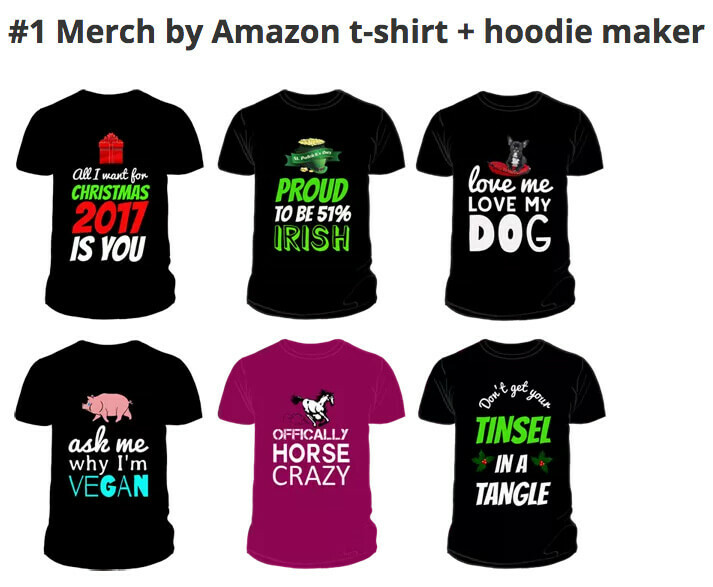 Key features: since a large part of Merch by Amazon t-shirt sales have a seasonal theme or design, WordRabbit provides an image search that is divided by seasonal or holiday categories. It makes it easier to sort through and find the elements you want. 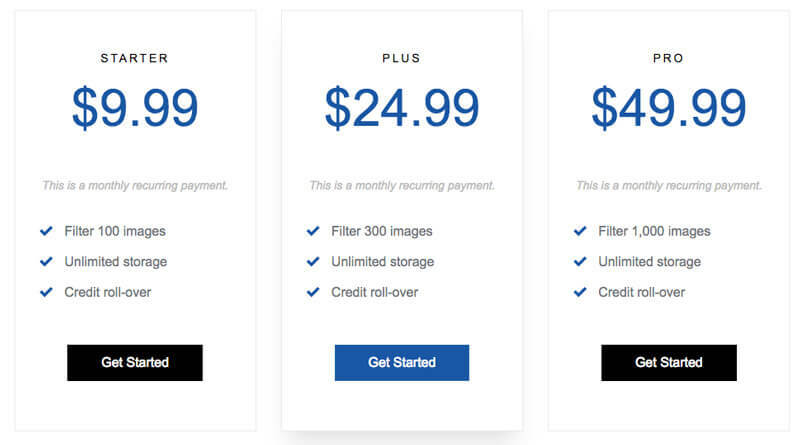 Pricing: the app is free, but you will need to upgrade to Pro in order to unlock features like the holiday art, cloud storage, and the option to upload your own fonts. A Pro account costs $9.99 a month or $49.99 a year. The downside: while the Pro version includes tons of great perks and design tools, the free version is a lot more limited, leaving you with little to work with. Bonus: if you have the design elements you need to make your t-shirts, there’s no need to pay for the service. Simply upload your own images and work on the free version of the app to produce transparent images ready for Merch by Amazon and other POD sites. Merchinator was created for Merch by Amazon sellers looking to expand their design catalog. 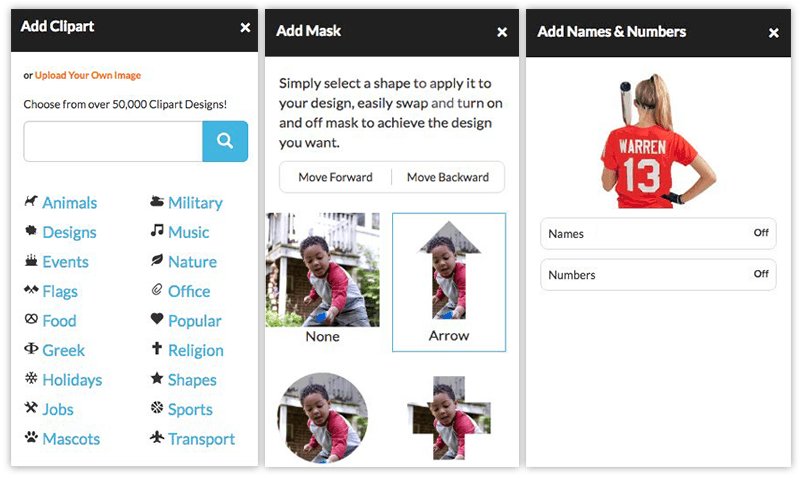 Although this program doesn’t allow you to create new designs from scratch, it does give you the option to play around with designs you already have. You can update old designs or simply give them a new look using the custom filters offered by Merchinator. Best of all, you don’t need any graphic design skills to use this program. Key features: Merchinator boasts 17+ filters that can help change the look of your already existing designs so that you can create variations of your best sellers. You can take a basic design and make it sepia toned, change it to grayscale, etc. Pricing: Merchinator offers 3 different options for subscribers. The most basic, or starter option, costs $9.99 a month and includes 100 images. The next level, or the plus option, costs $24.99 a month and includes 300 images. 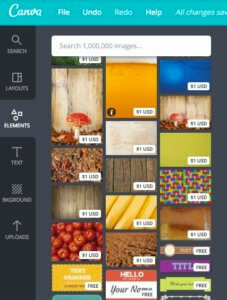 Finally, the pro option costs $49.99 a month and includes 1,000 images. The downside: you can’t actually design something completely new using this program. It basically just gives you the ability to quickly and easily create variations of your designs for a larger range to sell from. Bonus: no matter what option you choose, you will get unlimited cloud storage so you don’t have to worry about running out of storage space. Unused credits also roll over to the next month, so no need to worry about wasted credits. Customily is a W2P service that integrates into your e-commerce platform. It’s meant to provide your customers with the option to personalize your products to their liking, all online. The service is quite new but is already compatible with Shopify, WooCommerce, and Magento, among others. Key features: once integrated into your e-commerce platform, Customily allows your customers to personalize products, including t-shirts, monograms, jewelry, and phone cases. Pricing: Pricing isn’t readily available on the website, but they have different plans starting at $300 a month depending on your needs. Since their services are quite varied, you may need to request a quote specific to your store and products. The downside: Customily may not exactly be considered t-shirt design software, but it is a good option that allows your customers to design their own unique variations of the products you sell. Bonus: the demo they have available allows you to experience what their design platform will be like for your customers. Overall, it’s very aesthetically pleasing, easy to use, and produces great looking results. This W2P t-shirt design software was developed by experts who rely on over 10 years of e-commerce experience to provide just what the customer wants. This program is easily integrated across multiple platforms and can be used as a design tool in your web store or even as a full-fledged W2P storefront. Key features: there are so many features available that it’s hard to pick a few. It offers very complete text features, image features, a clipart manager, and object handling tools. Pricing: Brush Your Ideas has a few different price points, depending on the service you’re looking for. The most Standard option costs $799, the Pro option costs $1499, and the Ultimate option costs $2499. Although these prices may seem steep, they do come with 6 months of support and 1 year of free upgrades. If you are unsatisfied with your purchase, there is a 15-day money back guarantee. The downside: while they do provide a very well rounded product, the price makes it a difficult investment for new sellers trying their hand at the market. 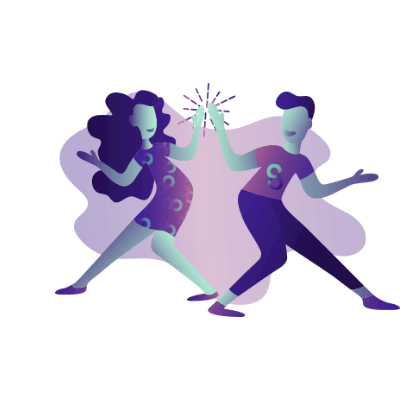 Bonus: their platform offers a huge number of features that are all very useful, and, even better, won’t affect your site’s performance! Placeit has everything for you to create and promote your t-shirt designs. T-shirt designs, mockups, logos, social media images and much more! Everything with only a few clicks. With our Unlimited Subscription, you can get every image for only $29 USD/month! Using Placeit's design templates is easy and will enhance your promotion efforts with professional quality images. You can also use Placeit's mockups to further improve your marketing campaigns and make sure your designs will take off before sending them to print. Don't Wait to Visualize Your T-Shirt Ideas. "How easier would have been to set up my tshirt store if I knew Placeit before"